Google has recently become a domain registrar and allows you register domains of many different types for a relatively low cost. You can use a domain registered through Google Domains, but you will either need to point an A Record to an InMotion Hosting server, or change the name servers to point to InMotion Hosting. The following tutorial will walk you through how to change the name servers to point to InMotion Hosting web servers. If you have multiple domains, you will need to select the domain where you will change the DNS. If you hover over the icon, you will see that the third icon to the right will be labeled Configure DNS. Click on this icon. 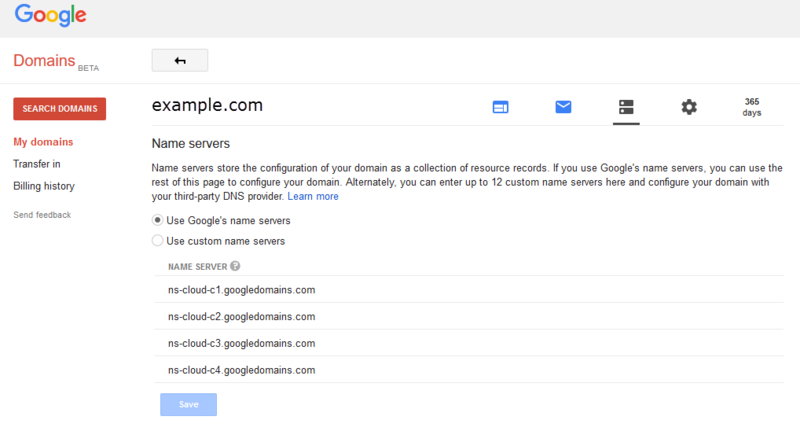 A section titled Name servers will appear and you will have the option to select either: Use Google's name servers or Use custom name servers. Click on Use custom name servers. Click on the blue button labeled ADD in order to add your name servers. If you make a mistake or there are name servers already in this section, you can click on Edit in order to make changes to name servers. Once you have completed adding the name servers, click on SAVE to save your changes. If you are using InMotion Hosting to host your website, then these are the only name servers you will need to add for your Google Domain. Remember that any changes to the name servers may require a propagation time of up to 24 hours to complete. The article says that it can take up to 24 hours for this change to take effect. How will we know when the process is complete? The actual time of propagation may vary in some locations. However, I like to use a third party Global DNS Propagation Checker to monitor the progress after changing name servers for a domain. I hope this helps! I have a domain registered with google. I want to use their services for name servers and e-mail etc. I just want to point my website to your hosting site. I do not want to use your name servers. Hey Vijay1250, thanks for your comment! You most certainly can set that up. You'll need to create/modify two records. The A record for your domain indicates which web server (IP) the website resides on. The record should use your domain and point to the IP address of your server/account. The CNAME record for the WWW version of your domain simply indicates the website is hosted on the same server. The record should use the www (www.yourdomain.com) version of your domain and point to the domain without the www (yourdomain.com). It's important to note that you'll need to ensure you are creating/modifying the DNS records where your name servers are hosted. Since you mentioned you are not using InMotion's name servers, you can not modify the DNS zone with InMotion's cPanel. Also, you'll want to ensure you don't have any conflicts in existing records in that DNS zone. You may need to modify existing A records that your mail services may be using. I can only advise that you reach out to them if you have a conflict, they should have an alternative solution for configuring their mail services with your DNS configured to host your website elsewhere. I also recommend reaching out to the host of your name servers to determine how to create the records as advised. I hope this helps! So, what happens if I don't want to create new email accounts in InMotion, but want to keep my G suite email and services up. Does changing the name servers disable my ability to keep my email on Google? Not necessarily, all you will need to do is set up Google MX records at InMotion before changing the nameserver information. Hi, what about the emails we create there? I guess we could create emails with the domain name here, right? Or should we use original emails there? If you point the name servers to us and intend on using us as your email provider, then you will need to create new email accounts here. You can create email addresses via the cPanel.